Basic reasons of preparing the Macedonian people for another uprising now in the Pirian part were many. First Turks, high taxes, not having a money to live and killing and torturing of the Christian population of Macedonia. From another side there was the activity of the Albanian gangs which were killing every non Muslim population. To be a free citizen was hard with their activity. The uprising in Bosnia and Herzegovina already started and also in Bulgaria. So the Macedonians decided to prepare new uprising in the place Razlovci. Part of the preparations were made in Solun (Salonica), and the other part - on the terrain where the uprising should started, in the Pijanec-Malesevo region. By the prepares in Solun worked the leader of this uprising, Dimitrija Pop Georgiev - Berovski. In the period of 1875/76 he was forced to be in Solun, onlu because the uprising. 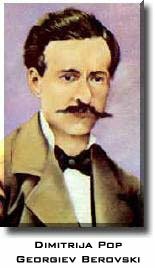 The prepares in Macedonia, where the uprising should started were leaded by the priest Stojan Razlovski, father of Berovski's wife. One of the biggest problems for the leaders of the uprising were the money. With that money they had to buy weapons, munitions, warm clothes for the uprisers. On one meeting in Solun, Stojan Razlovski sold his land in Razlovci and the animals to get money. With those money from the sold land of the both of them, they bought weapons, munitions, clothes. The weapons were taken as the biggest secret and were kept in a lot of secret places which the Turks had no idea of their existing in the region of Malesevo, Pijane, Radovis. Beside all of this the leader Dimitrija Pop Georgiev ask for help from two teachers from Solun. He wanted from them to create flag of the uprising. 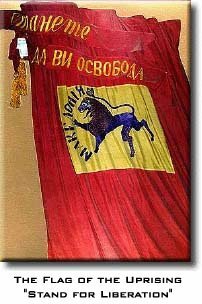 On the flag was written "MACEDONIA" and the revolutionary call "Stand for Liberation". During the month of April 1876 Dimitrija Berovski came in the village of Razlovci, to see the prepares leaded by Priest Stojan Razlovski. In the hotel of the Priest near the mountain Golak, Pijanečko region, property of Stojan, were made a couple of meetings. For war were already got ready around 30 specials. In the period of the last prepares, the Turks arrived in the village of Razlovci, to collect taxes. Afraid of the fact that they would be discovered they started the uprising on May the 8, year 1876. The final prepares were not made. The uprising first started in the village of Razlovci. The leader Dimitrija Berovski went in the region of Malesevo, so the uprising to take larger region of activity. He should been welcomed, there by more than 300 people from Malesevo, hard armed. But on the way to Malesevo suddenly his troop meet Turks. They started a battle near the village Mitrasinci. The leader, Berovski got a bullet in his head, but he didn't die. They had to go back in the village of Razlovci and they didn't meet with the troops from Malesevo. The troop of Berovski went to establish a contact to the troops of the local duke Cone Spasov who had around 40 uprisers in the village Laki. Together they destroyed the Turkish army (basibozuk). Then the troop of Berovski went to the village of Smilanci, near Radovis, where they had put weapons and munitions from long time before. Since the uprising took the region of the village of Pijane-Malesevo region, the uprisers wanted to start the uprising in the village of Smilanci. But unfortunately they were surrounded by a unknown man from Radovis, and the Turks reacted fast. That is the reason for the fact that the troop of Berovski couldn't go in Smilanci. So the uprisers in this region had unsuccessful try to make region of uprising activity larger. Reasons for the fast unsuccessful of the uprising lies at the not completely prepares of the uprising and at the fast wounding of the leader, Dimitrija Pop Georgiev - Berovski. Beside all of this the uprisers didn't connected to the other troop over Macedonia. A lot of Macedonians after this uprising were killed and tortured by the Ottoman Turks. Running away from the Turks, a lot of them emigrated to other countries. But from other looking side the Uprising of Razlovci has great meaning for the Macedonian people and takes important place in the Macedonian history.